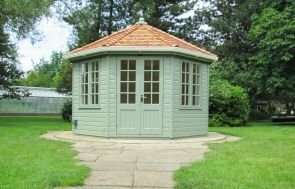 This Wiveton Summerhouse is our octagonal model in our collection of timber summerhouses. Each of our buildings benefit from delivery and installation by our specialist in-house team. This model was finished in planed shiplap cladding and coated in multiple layers of Valtti paint, combined with terracotta composite roofing tiles and leaded windows. 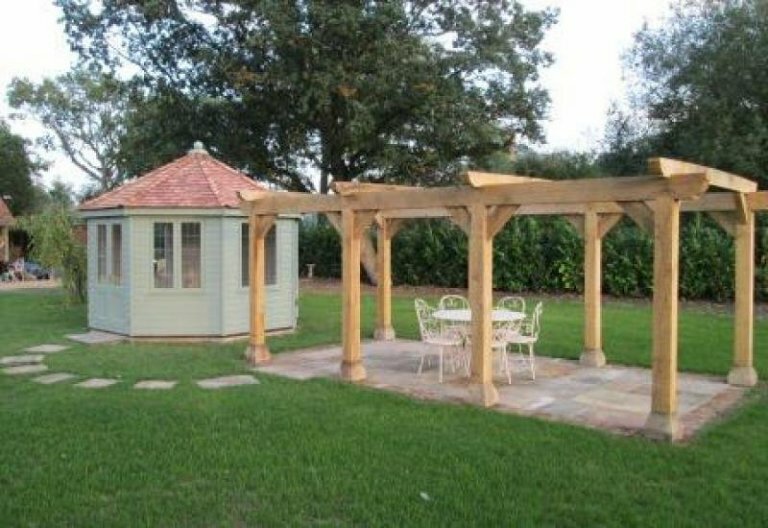 As you can see, the customer has designed a tranquil outside space complete with beautiful garden furniture and patio area, perfectly complimenting her Wiveton summerhouse. We have a number of different colours from a range of colour palettes to choose from. Subtle colours such as this one is often a favourite, allowing the building to blend into its surroundings. Alternatively, if you want your garden building to stand out and pull focus, we also have more bright, full colours for your choosing. Summerhouses are ideal as unique entertainment spaces, private reading rooms, or just simply a comfortable outdoor retreat. Our show centre, located just outside Newbury in Berkshire (one of many show sites across the UK) has a variety of different size and style display buildings on site for you to look at. Our friendly team are on hand to answer any queries you may have. 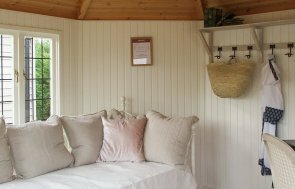 Alternatively, if you'd like to continue browsing our summerhouses online, you can go to their dedicated page by clicking the link below.